This installment of the survey results will focus on how people learn about workshops and shows and why they choose to attend (or not attend) them. There are some valuable directional insights here for anyone who's engaged in planning and promoting events. With all the events available in many markets, how does a raqs enthusiast choose where to spend his or her precious time and hard-earned dollars? We asked respondents to rank a number of decision factors in order of importance. Not surprisingly, the most important factors were who the instructors or performers will be and whether the event promises to be a good investment. 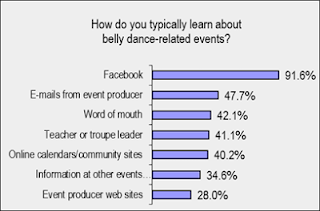 And of course, respondents also seek events that fit the style(s) of dance they currently practice. Many prefer events that don't require a lot of travel and (not surprisingly) don't conflict with other events on their personal calendars. Less important factors include the type of location where the event is held (whether it's a hotel, dance studio, etc.) -- most participants ranked this at #6. Availability and clarity of information is important, of course, but not an important factor to most respondents in actually deciding whether or not to attend. And though a number of people ranked it at #4 or #5, most are not extremely concerned with whether their friends, teacher, or troupe members will be there. The least important factor, by a wide margin, was how respondents feel personally about the event producer (i.e., whether they might decide to attend because they like the producer or whether they avoid the event because they don't care for that person). Very few respondents felt this was an important consideration. In many cases, newer community members are most likely not very familiar with the personalities behind events; and these responses indicate that it's the event offering, pricing, timing and location that really matter. What's the most effective way to get the word out about your event? Overwhelmingly, our respondents say Facebook. With a large and active population of dancers, musicians, and other enthusiasts, Facebook has replaced raqs-specific sites like Bhuz and Tribe as the place to go for news about events. To reach this audience, event producers simply must create business pages for their companies, create Facebook events, monitor the conversations on their pages, and maintain an active presence on Facebook. E-mails from event producers are another important source of event information, followed by various types of word-of-mouth communications. Event calendars (like Yalla Y'all) are also widely used. Less critical are posters or postcards at other events. And at the bottom of the list are the web sites of the event producers. In my day job, I've been seeing data that says an increasing number of consumers are going directly to a company's Facebook page instead of their web site for information. Web sites can be time-consuming to maintain; event producers might be wise to focus their time and energy on creating compelling Facebook content. You will, however, see an interesting conflict on this point with the #1 response to the next question... perhaps if web sites were more up-to-date, they would be considered a more important source of information. 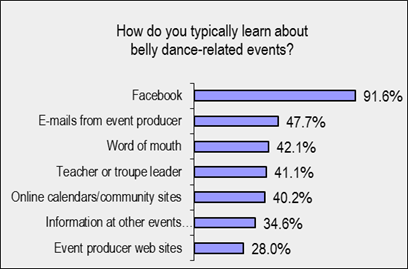 Other sources of information cited by survey respondents include Meetup.com, "posters and flyers around town," and belly dance magazines in print or online (e.g., Gilded Serpent, Fuse, etc.). When asked how event producers and community resources could improve the availability and quality of information about events, most indicated that they would like to have information further in advance. Obviously, multi-day workshops in particular require some advance planning and in some cases money-saving. Respondents also suggested that event producers could be more proactive about maintaining their web sites and making them easier to use. As mentioned in the question addressed above, web sites are considered one of the least valuable sources of information -- but responses to this question indicate that perhaps if they were kept more up-to-date, they might be a better option. Remember that visitors to your site can learn about much more than just the event in question... once they get to your site they can learn about your classes, upcoming appearances, student troupe information, other upcoming events, and much more -- if your site is up-to-date! Building your site in a content management system like WordPress can make it much easier to maintain than a traditional html site. Work with other producers to co-mingle events and make it less expensive. Stay tuned for the next installment of our survey results, which will address what frustrates event attendees when they go to a workshop or show, with insights on how to make their experiences btter and keep them coming back to your events!